Button Painter is an add-in for Microsoft Access that adds smooth gradient colors to your command buttons and allows for button color changes on mouse over and when buttons are clicked. You can create buttons similar to those used in Office/Outlook 2007 by default, or you can specify your own custom button colors. Add a nice cosmetic touch to your application and impress your boss, or your clients with this colorful and professional looking enhancement. When invoked from the Add-In menu, the Button Painter setup procedure updates* your application forms by adding special controls and event procedures. Your standard, bland MS Access command buttons will then come to life with color gradients that blend in with the Windows color scheme. Youll be able to easily add and remove these effects without affecting the function of your application. 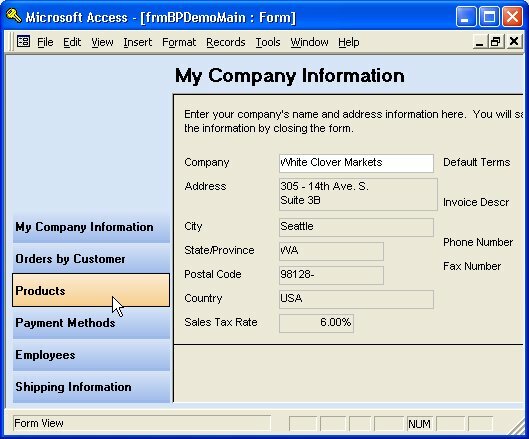 The demo includes an example of an order entry application that has an MS Outlook 2007 look and feel. This version is distributed as shareware. * Because Button Painter updates your forms, it is highly recommended that you make a backup of your database prior to using it.